These are my rings; my husband gifted me both; one at the time of marriage and one later. 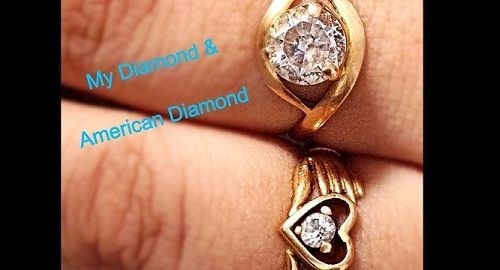 Out of these two, one is original diamond, and the other one is American diamond. But sometimes, I became confused seeing the glory of these two. Both are shining the same quantity. Sometimes, the American diamond shines brightly and other one remains glossy. But I have observed that, when the lights are more the AD shines a lot but when a small light is there in a dark room the Original diamond shows its glory. It amazed me then. Can you guess which is which? Which one is the original diamond?